Luxury Lakefront home on Magician lake. Large open family room / dining/ kitchen with 3 levels of glass facing the lake. Electric shades to help during the morning hours. Kitchen has large island for 6. Lower level rec room with Poker and air hockey, pool table, foosball. Movie theater on lower level as well. Lower level has large bedroom with 4 beds as well as 2 twin bunks outside the room. Sliding glass doors in lower level bedroom with beautiful lake views. Main level has bed room with King Bed and a twin bed and its own bathroom. Upper level has 3 bedrooms. 1 with King bed and a twin bed and private bathroom with shower and tub. The other bedroom is a kids room has 2 Pottery Barn bunk beds (4 beds) and has a attached Jack and Jill bath. Attached room has a King Bed. Loft has pull out sofa bed. Private Fixed Composite pier with ladder into the water both deep end as well as shallow for kids. Water mat off pier for guests to use . Although we love dogs we are not accepting ANY dogs with shedding hair into the home. Local and USA Long Distance included. Well-equipped, spacious and very comfortable home with all of the amenities. We had 13 for Christmas (15 to 85 years) and it was perfect for all. The lower level was the place for the teens with the large living room with amazing windows provided a great view of the lake for the grownups. The home was clean, very well-equipped, and all in good working order. Lots of extra features - the scond refrigerator in the kitchen was a very welcome surprise and even the gas stove. Everything was provided for groups - large driveway held all of our cars with ease. The other bedrooms were spacious and comfortable! Brian was extremely responsive when making the arrangements, and since we had no problems or questions - we did not need to reach out to him during our stay. 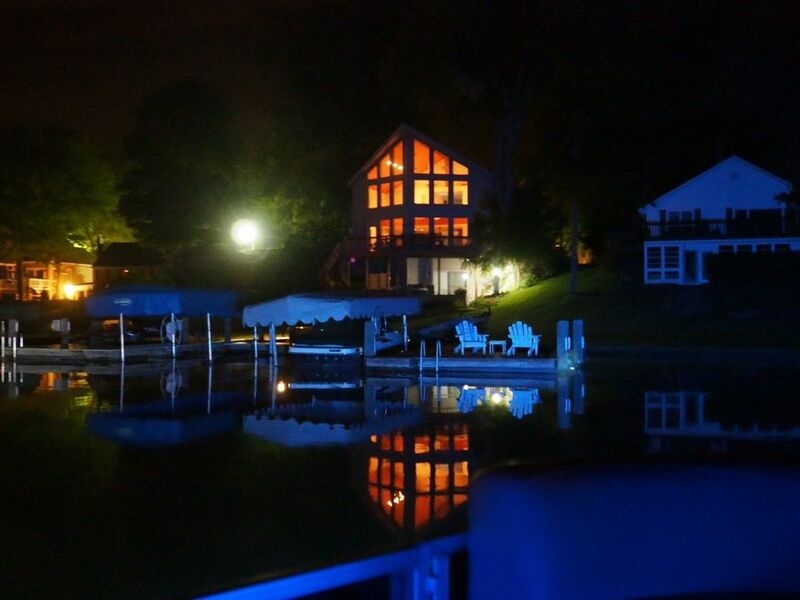 We highly recommend this property - we’d love to visit again in warmer weather to enjoy the lake! The house was very nice and roomy, and the owner was helpful. Amazing house - feels just like home! We rented this home over Columbus Day weekend. This house did not disappoint! It was very clean when we arrived. We had 18 people total, ranging from 2 to 73 years of age. We all very comfortably had room and beds, with a couple beds to spare. The beds were soft and comfortable. The bathrooms had amenities like shampoo, soap and hair dryers. The kitchen had two coffee makers and two refrigerators, which really helped with a big group of people. There were a lot of kitchen appliances and plenty of dishes. The game room downstairs was great during times when it rained and in the evenings. There was a canoe and paddleboat to use and a private beach area next to the water. Plenty of seating outside. The owner was great to deal with and always easy to reach. I would definitely rent this house again! The lake house was a fabulous place for our family to stay for a week. The lake house provided our family with a great variety of activities for our week. The house is beautiful, well taken care of, and very well stocked. We wish the fishing had been better. All in all it was a two thumbs up week. This is a dream house superlative in every way and the owner is very cooperative and friendly. This house has everything to make your vacation a success. All the toys are here and not just good but the best. We are avid boaters and we’re able to spend our time boating, tubing, swimming. The water is clean and clear the lake is beautiful. Friendly neighbors and people on the water helpful. We will be back not only to enjoy the house but to explore the area. Thank You Brian for providing such a great environment.